We wouldn’t buy with our pay. Like small hands waving goodbye. 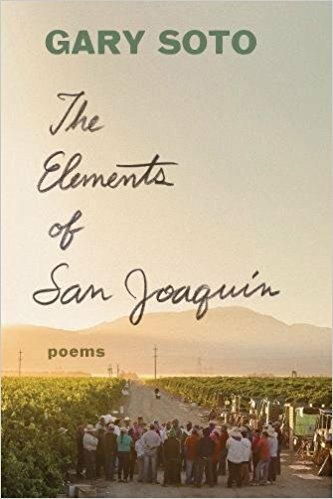 The Elements of San Joaquin holds up even after 40 years. This new and expanded version (Chronicle Books, 2018) is full of respect for farmworkers, family dynamics, and the rural landscape. Gary Soto lives in both Fresno and Berkeley. To his good friends at California Rural Legal Assistance, he has dedicated this book. 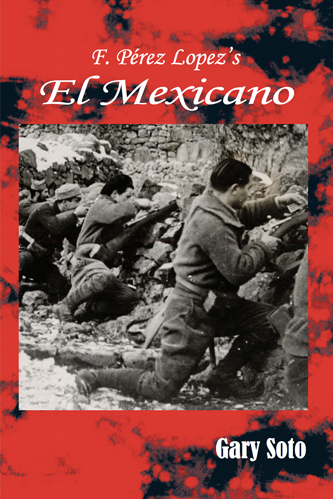 Physical and moral courage is no more gripping than in F. Pérez Lopez’s El Mexicano, a guerrilla diary of a volunteer soldier—later a farm worker—in the Spanish Civil War, 1936-39. Gary Soto retells the story of Pérez Lopez to remind us that courage, a major virtue, is awakened in good people when the cause is just. Pérez Lopez, as a member of the International Brigade, became a legend for his grito that prefaced attacks and earned him the nickname El Mexicano. Feared by the Spanish Legionnaires, Perez Lopez’s confidence was a magnet to his comrades who, like him, were determined to take down as many fascists as they could. He began as a recruit at the age of twenty and emerged a platoon leader in roadside skirmishes, firefights in villages and forests, and in the Battle of the Ebro, the last stand for the Republican cause. He became a prisoner, a medic, a favorite among nuns, and then an escape—his feats for survival are nothing less than genius. This is a tale of human dignity and one’s man’s unflagging commitment to justice. Both titles are available from Amazon—or by calling the author at (510) 845-4718.